Google has scheduled its next big launch event for October 9 in New York, where the Google Pixel 3 range is largely expected to witness an unveiling. However, this Google event might also see other Google hardware products getting showcased such as a recently leaked Google Home Hub smart speaker with a display and a next-gen Chromecast model. An interesting development has surfaced online in which an individual claims that he managed to buy the upcoming third-gen Google Chromecast from a BestBuy store in the US even before its release. Reddit user GroveStreetHomie took to the social discussion website this weekend to post an unboxed shot of what seems like a Google Chromecast dongle with a different design compared to the currently available second-gen model. According to the user, the packaging and design seem to be different from the second-gen Chromecast. “I thought it was just a design refresh taking queues [sic] from the Chromecast Ultra [sic].” The user notes that the new model seems slightly thicker, no longer has a glossy top, and the Chrome logo has been replaced by a small Google logo. It still has a Micro-USB port for charging. 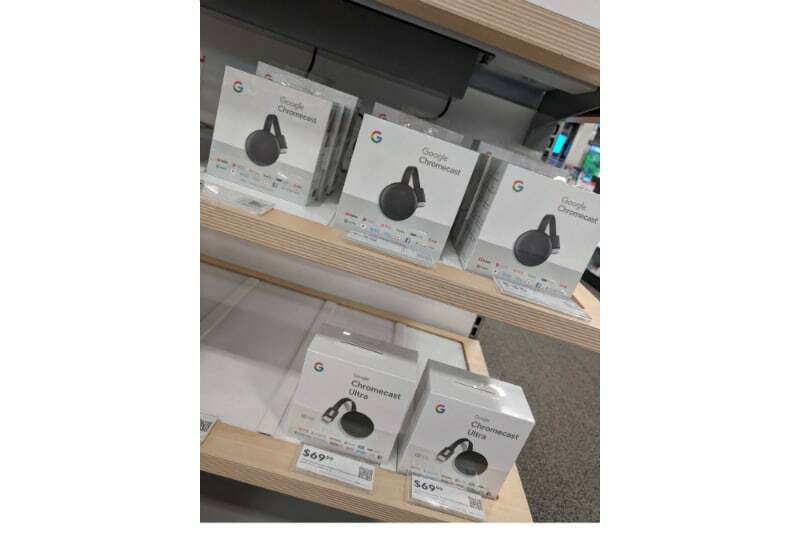 Yet another user on the thread posted a photo of the new retail boxes of the third-generation Chromecast being available on shelves, however the location was not mentioned. Apart from that, the original poster claimed that he was unable to set up to the device as the Google Home app wanted an update that has expectedly not been released yet. 9to5Google claims to have access to some more images of the all-new Google Chromecast which show the box and the device from different angles. The photos also show the FCC ID of the new Chromecast that matches the leaks from last month. The new Chromecast is expected to arrive with Bluetooth support. All other details such as pricing and availability will be clearer at the October 9 event.